It's not exactly true that we don't have seasons in California. They are less defined, to be sure, than East Coast extremes, but some seasonal variation does exist. 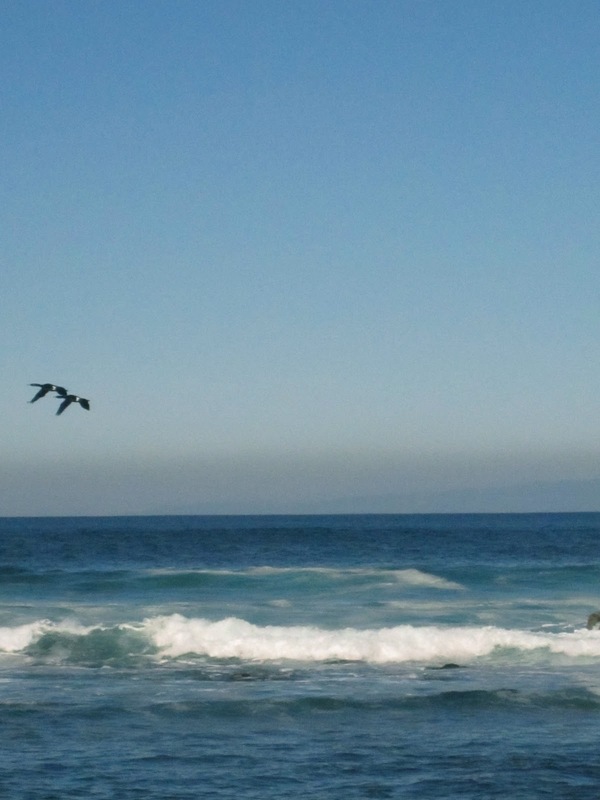 For example, after some 3 decades of confusion, my family finally realized that WINTER is in fact the best time to visit the Monterey Bay (see photo, left): far higher chances of clear weather, with gorgeous blue skies. Chilly, though! 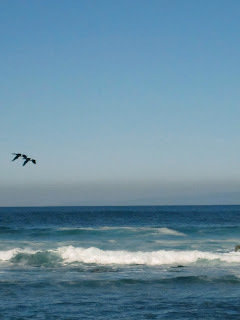 My childhood memories of Monterey are of grey, overcast summer visits. I'd have to say that there seems to be less fog and cloudiness in San Francisco during the winter as well. However, the general lack of freezing weather means that folks don't really use central heating very much, even though it's actually quite cold. Lots of shivering in restaurants! We thought we heard someone breaking into the apartment, but turned out it was a crow pecking away at the skylight. Of the bathroom, no less. Birds out here have no shame! The funniest thing is, you can tell these are San Franciscan starlings and not Boston ones by the sound of the passing cars- all hybrids (thus eerily quiet as they brake at the corner). Try to find such a street corner in Boston! !